Verdict: The iSpring RCC7 is efficient enough that it will keep your water bills and consumption rate lower. It’s also cost effective. In fact, for what you get the iSpring RCC7 is a great deal. Customer support is also helpful, and installation is fairly easy. As you’ll find if you keep reading this iSpring RCC7 review, this RO system is well worth the price overall. The replacement filters for the iSpring RCC7 are also fairly priced. Installation is a bit more difficult because the instruction manual isn’t the best. As you’ll learn in this iSpring RCC7 review, the iSpring RCC7 WQA is a reverse osmosis filter. It filters your home water in five basic steps, which we will discuss below. One of the biggest benefits to the iSpring reverse osmosis filter is that it’s cost effective. You’re not going to have to worry about spending a lot of money where this filter is concerned. That said, it’s a great value for the money you will pay. The first thing you’re likely to notice about the iSpring RCC7 is that it’s relatively compact. You should be able to fit it under any basic kitchen cabinet. It’s pretty easy to install so just about anyone should be able to do it on their own. Of course, the instructions that come in the box aren’t the best, so you might need to use some installation videos or tutorials to get the job done. Luckily, there are a few good iSpring RCC7 videos out there. iSpring RCC7 uses filters that offer added protection to stop any additional contaminants from getting in your water. The main filter is housed in a transparent location. This is handy because it means that you won’t have problems knowing when to change the filter or if you need to inspect the sediment filter. 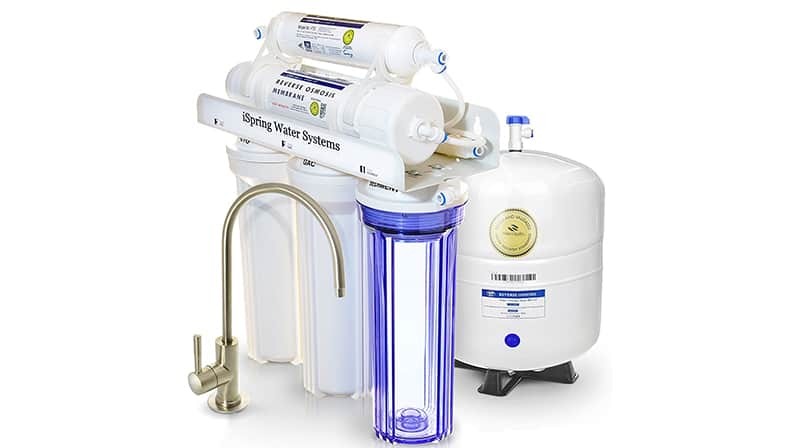 The iSpring reverse osmosis filter offers a waste water to pure water ratio of 2.5:1. This makes it above average when it comes to the efficiency of most reverse osmosis filters. To be considered efficient, an RO system needs to filter water without wasting more than 4 gallons for every gallon of pure water it produces. As the iSpring RCC7 wastes much less than that, it is an efficient option where RO systems are concerned. This is important because that means you’re going to waste less water, which means the amount of water you’re consuming is going to be less. This, in turn, will create a decrease in your water bills. More importantly, less water waste means less water use, which is environmentally friendlier than consuming or wasting more water. The biggest downside to installing the iSpring RCC7 is actually the instructions that are included in the box. If you’ve installed a reverse osmosis water filter in the past or you are relatively handy when it comes to average DIY projects, you should be able to get by with the instructions and previous experience. It might take a couple of hours, but you shouldn’t have any real trouble. If you’ve never installed an RO system, it’s likely that the instructions won’t be of much help to you. In this case, you might benefit from looking to instruction videos or tutorials. Websites like YouTube offer a variety of tutorial videos for the iSpring RCC7. As the instructions are not incredibly thorough, it’s highly likely that seeing the steps you need to take to set your RO system up will be more helpful. It’ll also ensure you have a smoother, faster time getting everything in order. If you find that the instructions have you stuck, and the videos leave you with questions, you can always contact iSpring’s customer support. The support team is excellent and will ensure that you get your system set up, even if they have to guide you through the process at each step. A 5-step filtration process is used with the iSpring RCC7. What that means is that your water is going to go through 5 filters before it hits the water tank and is delivered to you. Each filter is different. The different filters are meant to block particles and contaminants to ensure that you have cleaner, better quality water. This process with the added filtration also makes your water healthier, as there is a much lower chance for contaminants to get through. Filters need to be changed every 6 months to a year. Of course, this will vary slightly depending on your water source. Additionally, to keep the reverse osmosis membrane of the iSpring RCC7 functioning at top capacity that will need to be replaced every two years. The top filter is housed in a transparent unit, which allows you to check the quality much easier than some filters. If the filter appears to be dirty you should change it immediately. As the time to change the filter will vary based on your water quality, you may need to change it more than every 6 months. Once you change it the first time, you can assume you’ll need to change it that often from then on. The filters needed for the iSpring RCC7 are easy to find and are relatively inexpensive. Buying them 2-3 times per year would not cost too much and they are easy to change. While some previous reviews have complained about some leaking, if you use the tape that is offered by iSpring during the installation process this should lessen any potential problems with leaking. At less than $200 per RO system, you aren’t going to find a better deal than the iSpring RCC7. It’s a great system that is efficient and easy to use. Other than some problematic instructions, it’s well worth the money and the time you’ll spend setting it up.